The Alarm – Declaration 2014 is a 30th Anniversary revisionary version of The Alarm’s classic ‘Declaration. This version was also released on limited edition Red Vinyl with the 1984 track listing. 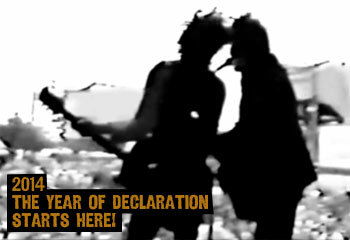 Stripped down and set free of the original arrangements, the songs on Declaration 2014 have been able to move with the times and are as relevant to life today as they were when written in the early 1980’s. “I felt like I could make a special record by treating the songs as if they had been written now,” continues Peters. 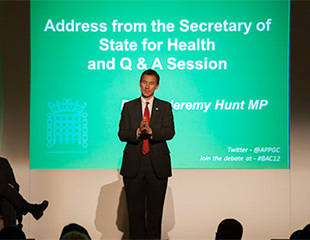 “It wasn’t an easy process and I very nearly turned back a few times along the way. I had to take a very disciplined approach that was governed by the first principle The Alarm ever had, and that was to make music with an acoustic guitar, drum, harmonica and voice”. Declaration 2014 features an unexpected yet most welcome collaboration with Acquire Choir (a community singing group from the village of Rhuddlan in North Wales). “I had an instinct to include a gospel choir,” remarks Peters, “I wanted a sound to represent the soul of the audience who have lived every word on Declaration and whose singing is a huge part of every show The Alarm play. The choir sessions were conducted in church and they were a most beautiful experience in itself. Once I heard Acquire sing ‘Blaze Of Glory’ I knew the album was going to be something beyond what I had dared hope for”. The title track ‘Declaration’ features ‘Ghostbuskers’, another community group of musicians from North Wales. “That was the one song I did not know what to do with,” says Peters. “I was actually going to leave it off altogether. I was at Tape Studios, North Wales getting ready to rehearse for The Gathering, when I heard about this community group which featured over 30 guitar, ukulele and mandolin players…. I was intrigued. I paid them a visit and we cut ‘Declaration’ in one take with my two young boys Dylan and Evan joining in on guitar too. It’s a beautiful sound and the last one committed to the record and fitting in that, for me at least, it creates an audible link to the community that is The Alarm and its extended family”. The album’s artwork has even had a major overhaul and is no less impressive. “I met a young designer named Daniel Shearn who has done some sterling work in graphics for film and theatre companies I was aware of, and commissioned him to redraw a new Declaration sleeve. I was not expecting the vision he brought to the project. As soon as I saw what Daniel had done, I could see instantly that he had kept the integrity of the original and added to it. It totally works with the new album, yet still reflects the spirit of the original most beautifully”. ‘Take this song of freedom put it on and arm yourself for the fight, our hearts must have the courage to keep on marching on and on’ – The Alarm – Declaration 2014.